Desirable Luxury Infinity Building. Rare Find! Gorgeous Corner (Destiny Model Approx. 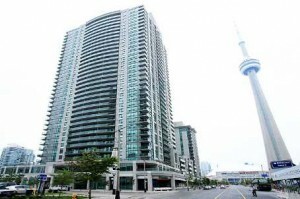 850 Sq Ft) With Unobstructed Stellar Lake And City Views, Stunning! Awesome Walls Of Glass. Gorgeous Decor & Quality Finishes. Minutes To ACC, Underground Pathway, Rogers Centre, CN Tower! Great Amenities. Infinity – 30 Grand Trunk Cres. 2 bedrooms, 2 bathrooms, with 1 parking space.